I was recently asked on Twitter why some Blue Line trains in the morning and at night go to Merlo, Elmonica, or Ruby Junction instead of all the way to Cleveland Ave or Hatfield Gov Center. Since Ruby Junction and Elmonica are the two yards where trains are stored when not in use, several runs will end such that the train can pull into the yard from the adjacent platform. Other runs will go to the ends of the line where the operator will clear the cars out and run the train out of service back to the yard. During rush hour, there are a number of “tripper” trains that essentially function to get people to either downtown or slightly beyond, but they don’t run the entire length of the Blue Line. The frequency of trains during rush hour means that if someone’s destination is beyond where the tripper goes, a train to the end of the line will generally be only a few minutes behind it. However, these trains work well for most commuters’ destinations. 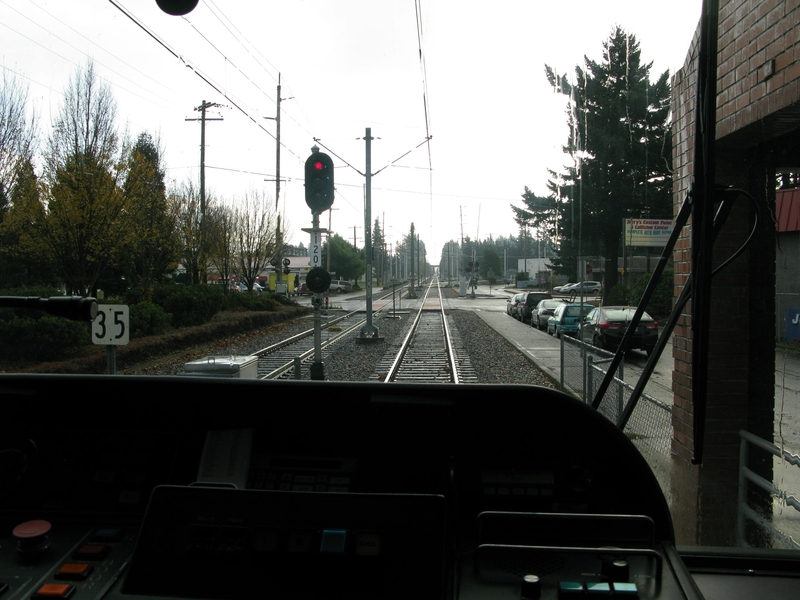 In the morning rush hour, westbound tripper trains have overhead signs to “Merlo/SW 158th.” At this platform, the operator will clear the cars of passengers and then bring the train into the yard. The signal for westbound trains at Merlo allows for a choice of routes – a normal route on the mainline to the Elmonica platform or a diverging route into the Elmonica yard. The rest of the signs would say “Not in Service” but Type 1s have to be manually scrolled, so this still shows how it was set at the beginning of the trip. This is somewhat different during the evening rush hour, when more people are heading out of the city than into it. 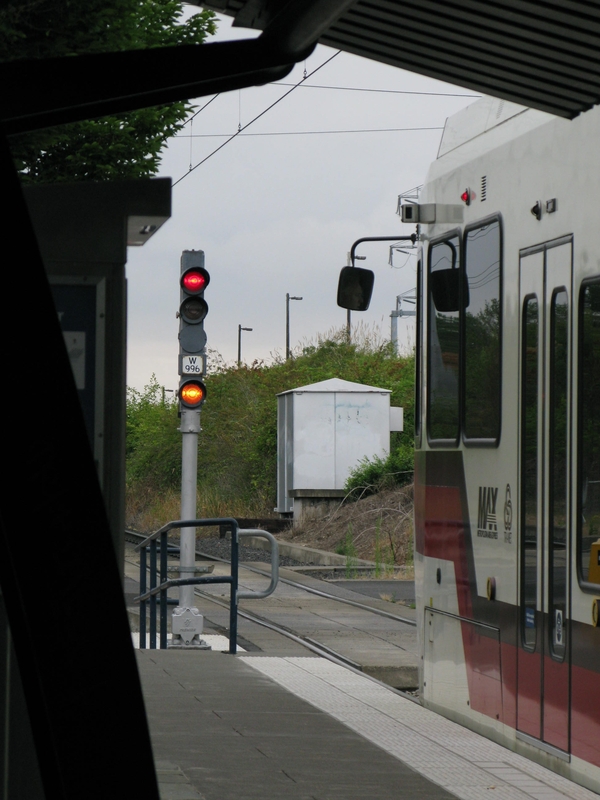 One of the ways passengers are accommodated in the evening rush is by westbound Red Line trains turning into Blue Lines to Elmonica, Willow Creek, or Hatfield, allowing them to get farther west than Beaverton TC. These trains run with overhead signs to “Gateway TC,” “Ruby Jct/197th,” or “City Center.” The “City Center” train is the one in the morning that goes east from Hatfield to Old Town/Chinatown, into Interstate/Rose Quarter, out of service up to the Broadway Siding, and then back to Merlo and into the yard as shown above. Despite the announcements that start downtown and tell passengers that the last stop for this train is IRQ and all passengers must exit (there is no platform in the Broadway Siding and no safe place for passengers to exit the train), without fail passengers ask “Aren’t you a Yellow Line to Expo?” at IRQ because this is the only scheduled train that makes a move like this. The Gateway-bound trains are like regular Blue Line trains from Hatfield through 82nd Ave. From 82nd Ave, they go into the auxiliary track at Gateway through the pocket track, where all passengers will exit since there is no platform for them to safely exit the train in the auxiliary track. Those trains will then go west from the auxiliary track back to Merlo, where they will pull into the Elmonica yard. The Ruby Junction trains will run as far east as the eastbound platform at Ruby/197th. Once there, the operator will clear the train of passengers and then bring the train into the yard for storage. 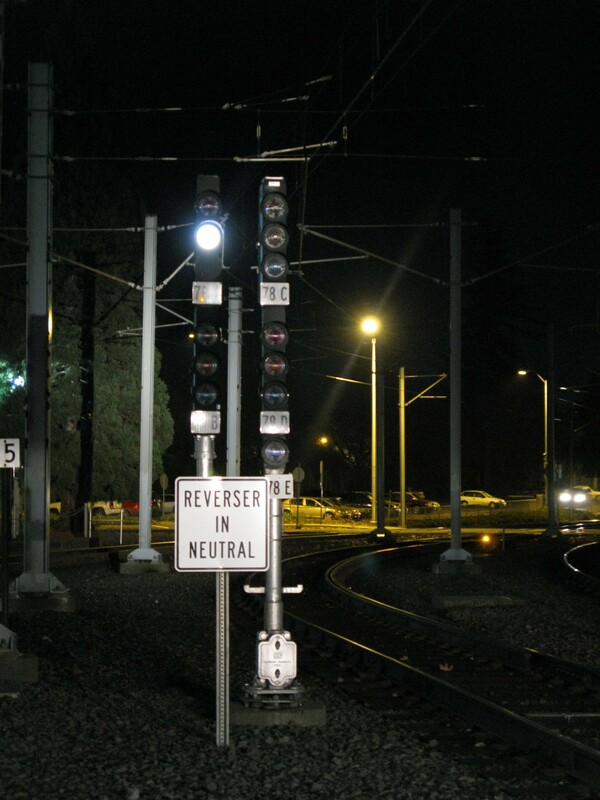 Similar to the ABS signal at Merlo, the signal here also allows for a choice of routes to either continue east or into the yard. 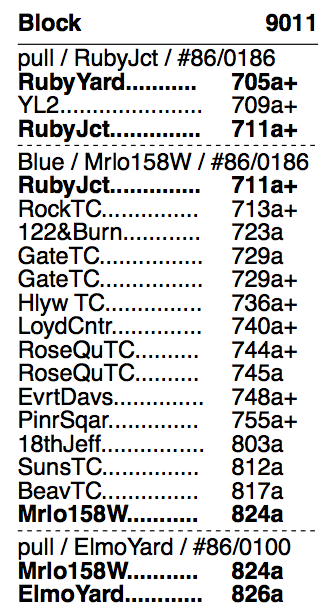 There are some other oddities with scheduling that people have questioned, like the westbound “Blue to Gateway TC” trains that are actually trains that leave the Ruby yard and run in service down Burnside to Gateway. 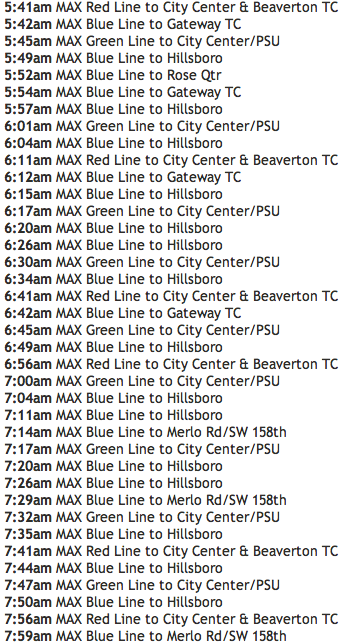 At Gateway, the operator will swap cabs and continue to Clackamas as a Green Line as pictured. 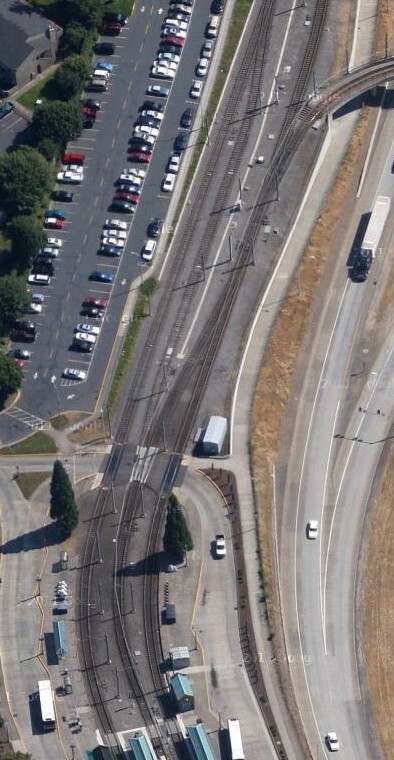 I’ve posted this picture before – a Green Line that had come in from Burnside sits in the auxiliary track at Gateway. It will wait for that Red Line coming off the fishhook to go through the pocket track first. 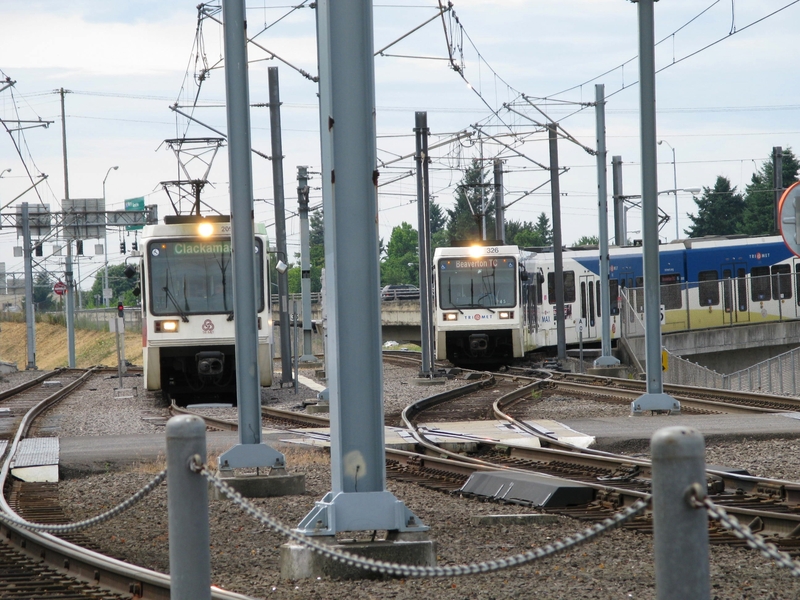 After the Red Line is gone, the Green Line will pull in to the pocket track, and the operator will swap cabs and call a route for Clackamas from there. 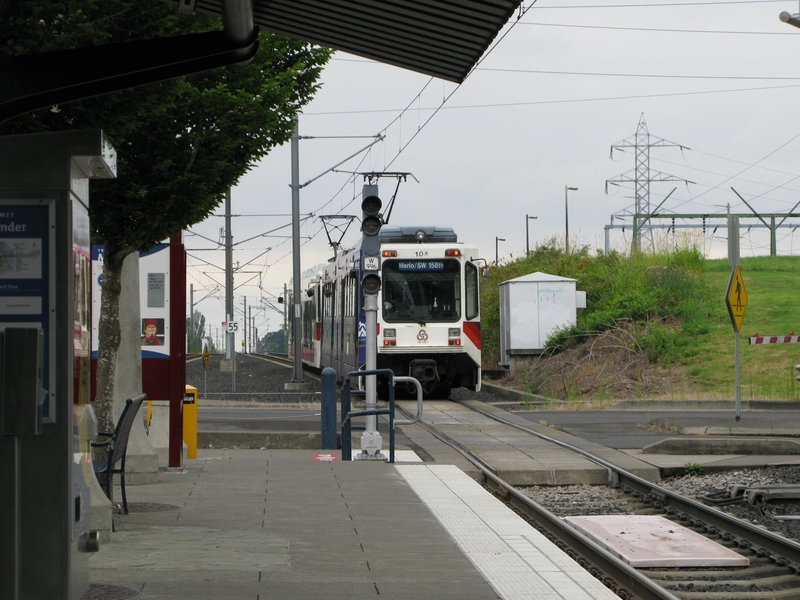 This process is reversed in the evening, where a Green Line from Clackamas will pull into the pocket track and call a route for Gresham (technically the Ruby yard, but either way that requires going on the eastbound mainline) and continue back to Ruby. 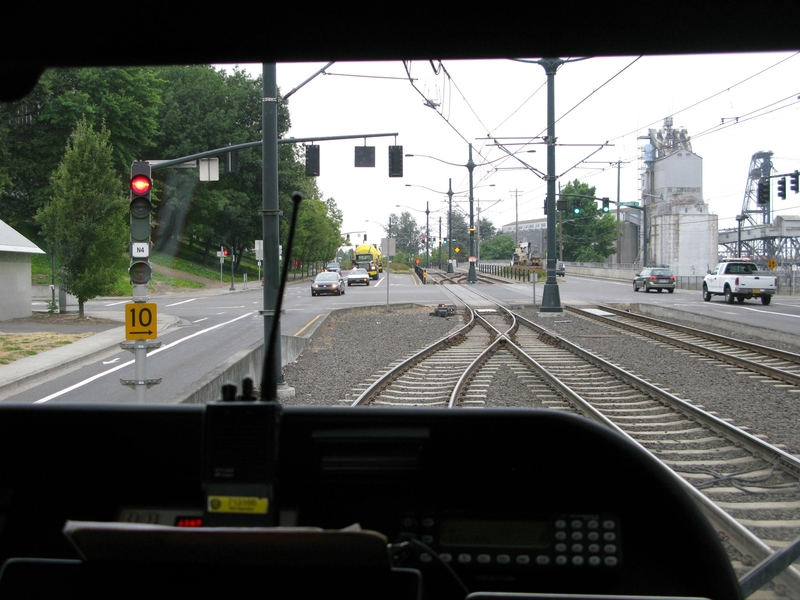 Similarly, Yellow Lines from Expo that are yardbound will call a route (no picture of that signal aspect handy) at IRQ that will send them through Rose Quarter and back to Ruby instead of the typical Yellow Line route over the Steel Bridge to downtown.